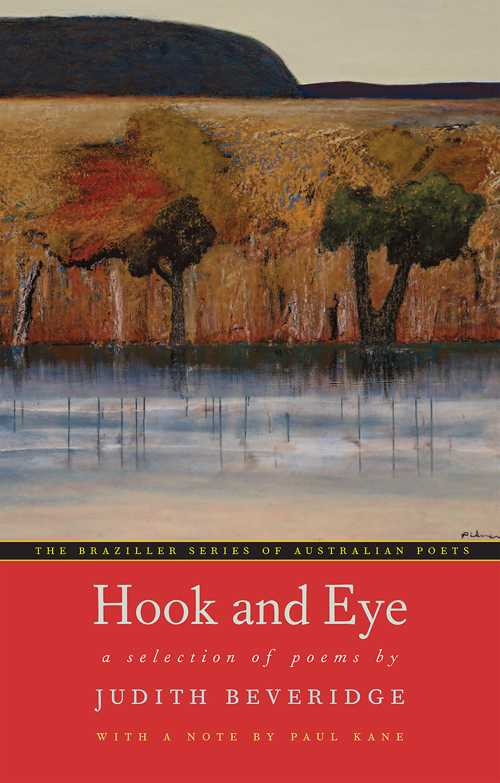 Musicality or lyricism defines the poems represented in Hook and Eye, a new selection of Judith Beveridge’s poems from The Braziller Series of Australian Poets. It is, after all, one of Beveridge’s trademarks. Beveridge is also known as a spiritual poet, not only as a result of her abiding interest in Buddhism, but also because of the ways in which her lyric verse, as Paul Kane suggests in his introduction to Hook and Eye, attains a ‘perfection’ of form that ‘transcends craft.’ However, the body from which the music of language arises – that sensory, sensual body – is nevertheless apparent in Beveridge’s poetry in fascinating ways. This paradox – that the body generates the spiritual disembodiment or feeling of transcendence associated with the arts and religiosity – is at the heart of Beveridge’s writing, as the placement of ‘Girl Swinging’ as the first poem in the collection suggests. as they sing about leaving for the Islands. Nailed by their wings to the gate. long-nose diva floating above my breath. However, the poems that are the most striking and memorable for me are those that dare to expose the body in all its complexity – that dare to contemplate the sexual body, the mortal body, the autobiographical body, the body as the site of injustice and pain – and not only the body as the site for lyric transportation. While Paul Kane argues that the fishing poems from Storm and Honey, featured in this selection, are ‘a tour de force of verisimilitude,’ it is not these poems of which I am thinking. As someone who spent her teenage years in an Australian coastal fishing town, Beveridge’s fishing poems strike me as exceptionally stylised, with little interest in the banal or, at times, ugly masculinity of such cultures. The more realistic or ‘earthy’ poems to which I am referring are more apparent in Beveridge’s earlier work, as the selection in Hook and Eye shows. This entry was posted in BOOK REVIEWS and tagged Bronwyn Lea, Judith Beveridge, Maria Takolander, Paul Kane. Bookmark the permalink.